When the mechanical properties of the system do not change then the system is in isolated state and it is called an isolated system. These systems are not interacting with environment and also called system with constant motion. The conservation laws are for isolated system because their properties are conserved and do not change. These laws are fundamental laws of mechanics in which the quantities like energy, angular momentum, and momentum etc. which are conserved quantities. In the conservation law of energy, the energy is conserved and it is only converted from its one form to another form to make the total energy constant. Here, we discuss about the conservation of momentum in which the momentum of a system remains constant. Momentum is the mass in motion. It's equal to mass multiplied by velocity. So, it depends on two factors that are how much and how fast an object is moved. So, in the conservation law of momentum, the sum of all object momentum remains constant in interaction within the system. It is true for all types of momentum like angular, linear etc. It is better explained by doing an experiment which is given as below. The law of conservation of momentum states that the momentum will remain constant no matter what until and unless any external force comes into action.This results into the fact that the center of mass of the system of objects will move with the same or constant velocity unless and until it is being acted upon by external force. The Conservation of momentum is mathematically the result of the homogeneity of space, i.e., conservation of momentum implies that the physical laws are independent of the position. Yet another consequence of the conservation of momentum is the Newton’s third law of motion that is the law of reciprocal actions. Let's take an example when a gun is fired if we assume that the initial position was at rest and hence the initial momentum to be zero the final momentum should also be zero according to the law of conservation of momentum. Also, it can be said that the time for which the force acted on object one is equal to the time for which the force acted on object two. Also, the impulse is equal to the change in momentum. M1 V1 + M2 V2 = 0 , Momentum is conserved. P1 + P2 + P3 + P4 + . . . . .+ Pi = K, where K is a constant. According to the law of conservation of angular momentum for a closed system the angular momentum always remains constant until and unless there is no external torque acting on the system. Example: During skating if the skater folds his or her hands then he is able to rotate at a greater speed as compared to when he opens his hands wide. This is on account of conservation of angular momentum. Where r is the position of the body or object with reference to origin and p is the momentum and hence equals to m v.
All the bodies have the power of exerting a force on other bodies that are in their line of motion. The magnitude or quantity that measures this capacity of the bodies is called linear momentum. The law of conservation of linear momentum states that the momentum will remain constant no matter what, until and unless, any external force comes into action. This results into the fact that the center of mass of the system of objects will move with the same or constant velocity unless and until it is being acted upon by external force. The Conservation of Momentum is mathematically the result of the homogeneity of space, i.e., conservation of momentum implies that the physical laws are independent of the position. Set up an apparatus as shown in the figure. Now, in order to demonstrate the collisions and the law of conservation of momentum, n number of balls are swing in. We will see that n number of balls would be swung out as well which demonstrates the law of conservation of momentum through collision. Figure: This apparatus is also called Newton,s cradle. The law can be proved by other methods as well, like using trolleys and demonstrating collisions. When atoms collide with each other the law of conservation of momentum is followed. When the bullet hits the wooden block the law of conservation of momentum is followed and the block rises to a particular height. When two cars hit each other in an accident then the law of conservation of momentum is followed. When a baseball is hit by the bat the law of conservation of momentum is followed. When two runners collide in a race then the law is followed. Two billiard balls colliding with each other. Before and after the view of a collision. The white ball loses momentum, and the yellow ball gains momentum. 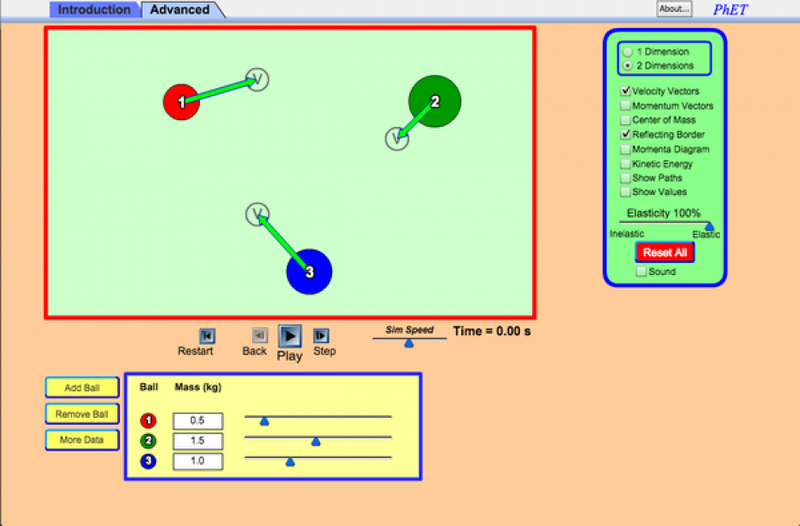 The total momentum of the two ball is the same before and after. The momentum vector before the collision equal to the momentum vector after collision. Question 1: A mass of 4 kg is moving at a speed of 10 m/s in a frictionless surface. It collides with a 3kg mass moving in the same direction at 5 m/s. What is the final velocity of the system after the collision? Question 2: There are two cars moving at a speed of 50 km/s and 70 km/s with mass of 100 kg and 60 kg respectively. Find the final speed of both after collision?